Baroque composers. What comes to mind spontaneously? Bach, Vivaldi, Rameau maybe? And yes, if you remind people, specifically, there’s also Telemann. Personally, my “ranking” of baroque composers is very simple: Johann Sebastian Bach, After that, with some distance, Georg Friedrich Händel. Then for quite some time pretty much nothing else, and finally, all the rest. Let me explain. Vivaldi is “nice”, but the nasty saying that he composed only one violin concerto – but 200 times – has some truth to it. I usually get bored pretty quickly. Then there are the composers I still don’t “get”. I’ve never heard any Scarlatti (Alessandro and Domenico) that personally touched me. For the French baroque stars with Rameau, Lully, etc., well, I’m currently in learning mode. For Purcell, I love Dido and Aeneas, but still need to dig much deeper into the rest of this oeuvre. And then there is Telemann. He probably didn’t do himself a favor by composing the famous “Tafelmusik” (literally “table music”, apparently a marketing term invented by Telemann himself to better sell his music). I wouldn’t be surprised if I’m not the only one who uses Telemann’s Tafelmusik as background entertainment when receiving guests for a dinner party (usually after preparing a rather fancy dinner decoration including lots of chandeliers that even Mr Carson of Downton Abbey would approve of). In a nutshell, the 18th century equivalent of the latest Café Del Mar mix. But I pretty much didn’t know anything else from him, beyond the infamous recorder concertos (remember that horrible instrument that many kids, including me, get tortured with for educational purposes). So as you can see, Telemann didn’t have an easy start with me. However, when Classica Magazine gave a “Choc Classica” (their way of saying 5 stars) to a Telemann album in the latest issue of the magazine, I was intrigued. I figured I had to get it just to revisit my Telemann bias. I’m glad I did, in spite of the weird monkeys playing backgammon cover, and the fact that I hadn’t (consciously) heard of any of the artists on this album. I’ve been very positively surprised by several albums from the French Alpha label in the past, including the outstanding 6-album Café Zimmermann Bach cycle, so that helped a bit. Alexis Kossenko is a French flute player that founded the period instrument orchestra “Les Ambassadeurs” around 5 years ago, mainly composed of younger musicians. I only noticed after purchasing this that I already had another excellent album with this orchestra, the recent Sabine Devieilhe Rameau recital “Le Grand Théâtre de l’Amour” on Erato, purchased relatively recently as part of my self-educational efforts with regards to French baroque composers (see above). What do you get on this album? An overture, a violin concerto, two flute concerto, and a flute/violin double concerto. The latter is really my favorite of the album. All played with so much energy but at the same time attention to detail, it is a pure pleasure. This music is no b-minor mass obviously, but certainly on par with the Brandenburg concertos or Overtures by my admired Johann Sebastian. 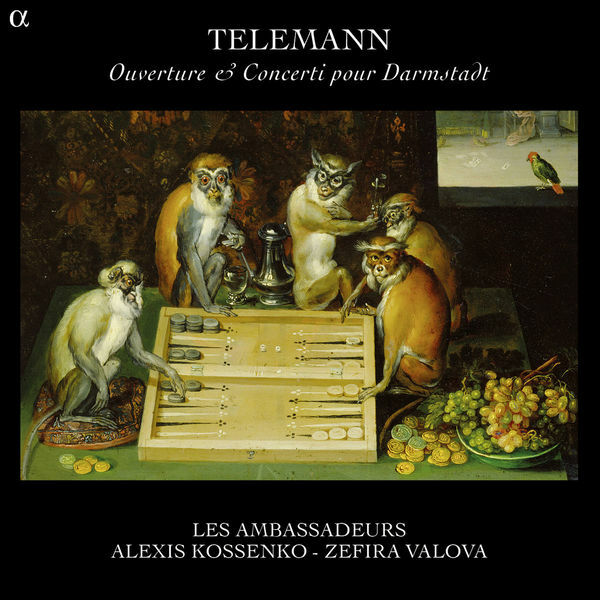 I really need to explore more Telemann, and certainly more of Les Ambassadeurs. As a bonus, Alpha is doing a great job in making their recordings sound very well, so if you have a good hifi, you’ll certainly enjoy this album even more.